We’d love your help. Let us know what’s wrong with this preview of The Fundamental 5 by Sean Cain. 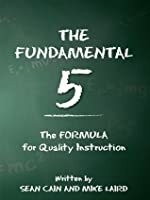 The Fundamental Five: The Formula for Quality Instruction, shares with teachers and school leaders the five practices that every teacher can, and should, use to dramatically improve instuctional rigor and relevance, and student performance. To ask other readers questions about The Fundamental 5, please sign up. 1. I do not do well with books I am required to read. I am 79% more likely to irrationally dislike them. And yes, this is why I so rarely assign specific books to my students. 2.a. I did some coaching this past year and it was eye-opening for me...I have better insight than I used to into what is sometimes happening in other classrooms. So I am willing to concede that what is 1. I do not do well with books I am required to read. I am 79% more likely to irrationally dislike them. And yes, this is why I so rarely assign specific books to my students. 2.a. I did some coaching this past year and it was eye-opening for me...I have better insight than I used to into what is sometimes happening in other classrooms. So I am willing to concede that what is obvious to me is not, in fact, obvious to all. 3. There is an appalling over-reliance on unpublished research by the authors. 4. The writing. It is so, so, so, so, so bad. I read parts out loud to my husband just to see him face-palm. Should I dip back in to find you a quote? "The teacher simply groups students in groups of two to four. Two students is, of course, the minimum size of a group, due to the fact that it requires at least two people to have a conversation..." Also, the authors refer to themselves constantly in the third person. It makes me hate them. 5. The authors are so OBVIOUSLY out of the classroom, and yet at one point they claim that because they are conducting seminars for teachers, they are "current practitioners involved in daily action research." Arrrrrgh. Just leave that out, ok? The goal clarity coach at my new school recommended that I read this book to help me make the adjustment from teaching in a high school (which had been the case for the entirety of my 14-year career) to teaching Spanish in an elementary school. What a goddess she is! I owe her more than I can ever repay. Co-authors Sean Cain and Mike Laird, one-time teachers and principals in Texas, have turned consultant and produced this slender volume. It contains a five-step prescription — duh! It’s right in The goal clarity coach at my new school recommended that I read this book to help me make the adjustment from teaching in a high school (which had been the case for the entirety of my 14-year career) to teaching Spanish in an elementary school. What a goddess she is! I owe her more than I can ever repay. Co-authors Sean Cain and Mike Laird, one-time teachers and principals in Texas, have turned consultant and produced this slender volume. It contains a five-step prescription — duh! It’s right in the title! — for better classroom management and better student engagement (which, of course, are tied). They’ve got some spiffy nomenclature, but, in essence, the steps are posting your learning targets (and planning a reminder at the end), moving around the room, give kids chances to discuss what you’re teaching (and they’re learning), recognize even small improvements and achievements, and use exit slips. I recommend this for all classroom teachers, new and seasoned. It is another one that I have highlighted up and will be revisiting between now and the beginning of school. Cain and Laird present 5 concepts that are not new to educators, but when used together create a formula that has been proven to increase academic achievement in schools and students. It is tragic and disrespectful to teachers and students for school districts to spend taxpayer dollars on a self published book of rubish that fabricates new research, plagiarizes valid past research, and spews theories that don't hold up to social science standards. There are no real citations of real studies-- not a single peer reviewed scholarly journal. The authors actually cite themselves and what they call their own unpublished "research"! One of those unpublished research citations claims It is tragic and disrespectful to teachers and students for school districts to spend taxpayer dollars on a self published book of rubish that fabricates new research, plagiarizes valid past research, and spews theories that don't hold up to social science standards. There are no real citations of real studies-- not a single peer reviewed scholarly journal. The authors actually cite themselves and what they call their own unpublished "research"! One of those unpublished research citations claims to have reviewed 17,000 classroom observations. Yes, 17,000. Go ahead, laugh. Because I did. The authors have large gaps in basic logic. They believe their approach works because the pass rate went up from ONE year to the next: 1. it's only a year 2. there are other factors that may attribute to higher pass rates: teacher differences, student differences, parental involvement. 3. Pass rates aren't anything to get worked up over anyway since that means 65% in most cases. All of their charts and graphs are unscientific and manipulative. One table tries to represent the success of their program from one set of observations to the next. The problem is they're comparing 147 observations to 985. The more observations there are, the more you're going to see techniques they're arguing for, which says nothing of their influence on those results. Some of their techniques, which aren't their techniques, have been around for a long time and are common methods. Proximity of instruction is a great example of good practice, though hovering over students is a terrible idea. Framing the lesson, at least the way they suggest, is a simplistic ineffective approach that is built in to look good and satisfy administrators. "Purposeful talk" is anything but that, and their version of "writing critically" (four words on a sticky note) is a joke. The most damaging part of this book is its bandwagon approach to all the common bumpersticker slogans teachers now hear about what they need to do: "attention span is down, so we have to adapt" "make everything fun for the kids" "groups, groups, groups." Instead of working to improve the next generation, teachers are to told adapt to them and continue to put them at a disadvantage. A former football player praises this poorly written book on the back cover and claims this book has taken Texas schools from worst to first. Yet I've never seen Texas on any first place ranking for academics (maybe he's referring to football?). In fact, Texas is still in the bottom ten ranked states for education. Best practices condensed into a perfect, workable, well-explained formula. If you haven't read this book, but you are an educator, you need to read this! Planned questions for frequent, small group, purposeful talk is my biggest take-away, but I'm going to challenge myself to do even more of the other points as well. I wish I'd read this years ago. Yes. It's that good. You read it and go "duh, that's just good teaching." Then you start to look around and you go, "I'm sorda' doing that" or "Well, I was asked to do it this way, but it's just not working for me." I am telling you that going back to these basic 5 things has changed my teaching for the better, and my students are benefiting from it. I spend LESS time lesson planning, LESS time preparing materials, LESS time on all those little tasks a teacher does. I spend MORE time with my students. They spend MORE time using higher order thinking skills. They spend MORE time using the things we learn in class both in class and out. They are making progress QUICKER. I've noticed that my lessons use more and more of the higher verbs and less and less lower verbs. I hate I borrowed it. I couldn't put it down, but couldn't write in it....recommended by my academic dean....was a confirmation of my teaching style, but have me a way to tie it down more...worth the read! This was a school-mandated read from the end of last school year for this coming year. I checked it out the day it was mentioned and took a while over the summer reading it. I had implemented a number of things it talks about and it definitely has helped in certain circumstances if not in others. all in all it was a semi-helpful and inspiring read before coming into teaching my AP classes this year. This was required reading for teachers in my school. It seemed like common sense for most good teachers. A few good reminders. I struggle with “framing the lesson” and seeing the importance of putting objectives on the board. It helped explain the reasoning and studies behind it, but I still seem to resent being told to do it... hmmm. Fast read, mainly because it was short. Not a ton of new knowledge gained, since I already do some of these things. Definitely could do more though, and it gave pretty clear examples of implementing the fundamental five. This is a good handbook to have, especially for an early-career teacher. While it doesn't present anything new or groundbreaking, the way it is collected, presented, and reinforced makes it a valuable resource for teachers who want to step up their game (read: all teachers). Very informative and likely to recommend to other professionals. The book has a great deal of ideas to implement in the classroom. Excellent focus on the foundational practices of education. It's always good to refresh and dive more in depth with fundamental practices. 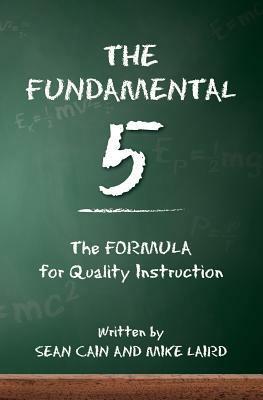 My district is implementing The Fundamental 5 this year. After reading the book, I am excited to see it action. We even had the chance to hear from Sean Cain himself. Having just finished my master's degree in adolescent literacy, I feel that this is a ridiculously compressed attempt to increase literacy across contents with five basic steps. Literacy instruction is so much more complex and nuanced than this book leads the reader to believe. Finally, the evidence presented is outdated. I know firsthand literacy instruction is powerful, but it is not an easy, quick transition from the more traditional methods of instruction to student-centered classrooms. I ho Having just finished my master's degree in adolescent literacy, I feel that this is a ridiculously compressed attempt to increase literacy across contents with five basic steps. Literacy instruction is so much more complex and nuanced than this book leads the reader to believe. Finally, the evidence presented is outdated. Must read for all teachers! Relevant read for improving academic instruction for greater learning through the use of 5 easy to implement steps. Clearly defines the whole picture of a well crafted lesson!! Loved this book-fast read! Great book for any teacher. Our new incoming principal asked us to read this. It was short and to the point and a great staff book share! This is carefully written to get to the point of "good teaching." Available for checkout at NELC. Easy to understand practices to affect major change in instruction. Everyone can do this but it won't be easy. Great guide to remind educators to post guidelines/frames/closings for daily lessons. Thus is going to change the way I teach! Looking forward to a new year! We read this as a school faculty. Some really good ideas. If you are a teacher new or old, this book will help you create a workable lesson plan frame that will deliver success for you and your students. Easy read with good practical advice for the classroom. I like the idea that, when used together, these "simple" strategies can have a powerful impact on student learning. I'm looking forward to trying them.